GLENDALE, ARIZONA --- The Arizona Coyotes selected seven players on day two of the 2015 NHL Entry Draft at the BB&T Center in Sunrise, Fla., on Saturday. Christian Fischer (left). Photo by Getty Images. The Coyotes drafted forward Christian Fischer, USA Hockey NTDP, with the 32nd selection in the second round. The 6-foot-1, 212-pound Fischer registered 15-15-30 with a plus-16 rating in 25 games last season. The 18-year-old native of Wayne, IL recorded 2-1-3 in four games with the U.S. National Under-18 team that finished second in the U18 Five Nations Tournament. Fischer also totaled 1-1-2 in four games to help the U.S. National Under-18 team win the 2014 Four Nations Tournament. He won a gold medal at the 2015 U18 World Junior Championship with Team USA and is committed to the University of Notre Dame. With the 63rd overall pick (third round), the Coyotes selected defenseman Kyle Capobianco, Sudbury (OHL). The 6-foot-1, 178-pound Capobianco recorded 10-30-40 in 68 games with the Wolves as an assistant captain. The 17-year-old native of Mississauga, ON finished tied for the team lead in assists and tied for second in points. Capobianco won a bronze medal with Canada at the 2015 Under-18 World Junior Championship. 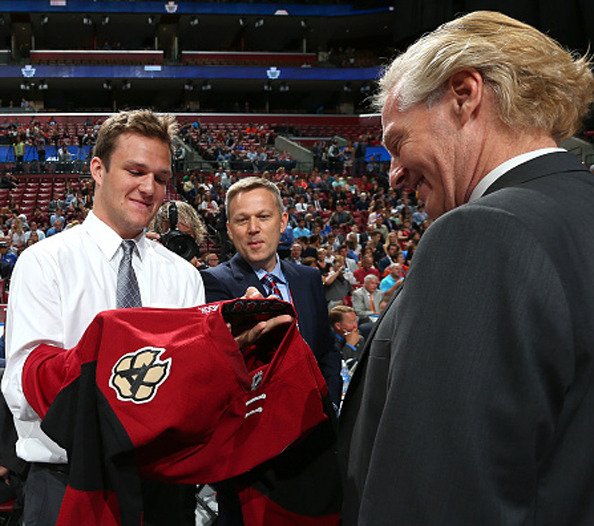 Arizona acquired the 76th and 83rd selections from the Calgary Flames in exchange for the 60th overall choice. 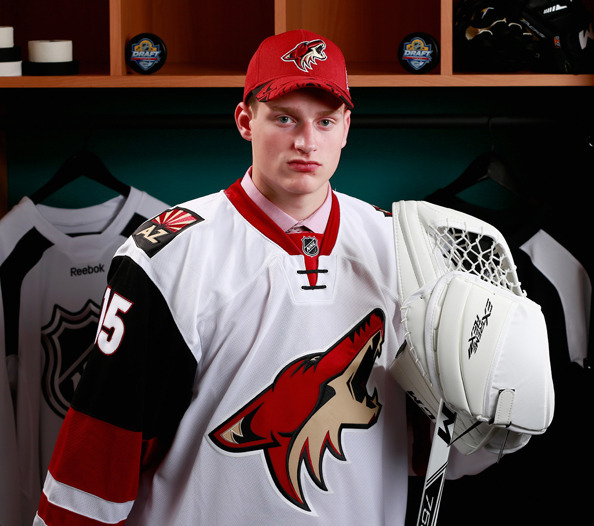 In the third round, the Coyotes chose goaltender Adin Hill, Portland (WHL), with the 76th selection. The 6-foot-4, 198-pound Hill registered a 31-11-1 record with a 2.81 goals against average (GAA) and a .921 save percentage (SV%) in 46 games with the Winterhawks last season. The 19-year-old native of Comox, BC led all WHL rookie goaltenders in wins and ranked first in the league in save percentage. Hill was named the Canadian Hockey League's Goaltender of the Week for the week ending January 4, 2015 after he posted a 2-1-0 record, a 0.67 GAA, a .978 SV% and two shutouts. He guided Portland to the Western Conference Final in the 2015 WHL playoffs by collecting a 2.96 GAA and a .911 SV% in 17 contests. The Coyotes selected forward Brendan Warren, USA U-18 (USHL), with the 81st overall pick. The 6-foot, 191-pound Warren totaled 17-17-34 in 52 games with Team USA last season. The 18-year-old native of Carleton, MI collected 13-26-39 in 53 games with the USA U-17 team in 2013-14. Warren is committed to the University of Michigan. Adin Hill. Photo by Getty Images. Arizona chose forward Jens Looke, Brynas (Sweden), with the 83rd selection in the third round. Last season, the 6-foot, 180-pound Looke recorded 2-4-6 in 43 games with Brynas in Sweden's top league. He also added 10-8-18 in 18 games with the junior team. The 18-year-old native of Gavle, Sweden was the youngest player and scored three goals on Sweden's World Junior Championship team. He also represented Sweden at the 2015 Under-18 World Junior Championship and the 2014 Ivan Hlinka Memorial. Looke finished 10th among European skaters in the final NHL Draft Prospect Rankings. Forward Conor Garland, Moncton (QMJHL), was selected by the Coyotes with the 123rd selection in the fifth round. The 5-foot-8, 163-pound Garland registered 35-94-129 in 67 games with the Wildcats. He led the QMJHL in points, assists and power-play assists. The 19-year-old native of Scituate, MA was a co-recipient of the Canadian Hockey League's Sherwin-Williams Top Scorer Award as he and Dylan Strome finished tied for the CHL scoring lead. Garland was the first Wildcats player to win the award and the second American player (Patrick Kane - 2007). The Coyotes' final selection in the 2015 Entry Draft was goaltender Erik Kallgren, Linkoping Jr. (Sweden), with the 183rd overall pick in the seventh round. The 5-foot-11, 157-pound Kallgren registered a 1.75 GAA and a .936 SV% in 34 games last season. The 18-year-old native of Stockholm, Sweden also tallied a 2.52 GAA and a .920 SV% in seven postseason games. The Coyotes will hold their prospect development camp from July 7-9 at the Ice Den (9375 East Bell Road, Scottsdale, AZ 85260). On-ice sessions are set for 2:15 p.m. to 3:45 p.m. on July 7 and 9 and from 1:50 p.m. to 3:20 p.m. on July 8. The practices are free and open to the public.